A gift of friendship from the people of France, Statue of Liberty National Monument long represented the first glimpse of the United States for thousands of immigrants arriving across the Atlantic Ocean from distant lands. The 93 m (305 ft) statue's large pedestal includes an interior exhibit explaining the significance of this icon of liberty and democracy. Designed by sculptor F.A. Bartholdi and dedicated in 1886, the statue represents the Roman goddess of freedom holding a torch and a tablet of laws. It's essential to book tickets in advance. "Pedestal" tickets give you access the inside of the pedestal, the museum, and the Fort Wood level. Reservations to visit the crown can fill up to six months in advance. Ferries depart from Battery Park, New York or Liberty State Park, New Jersey. Check the ferry schedules and leave plenty of time for the security screenings. 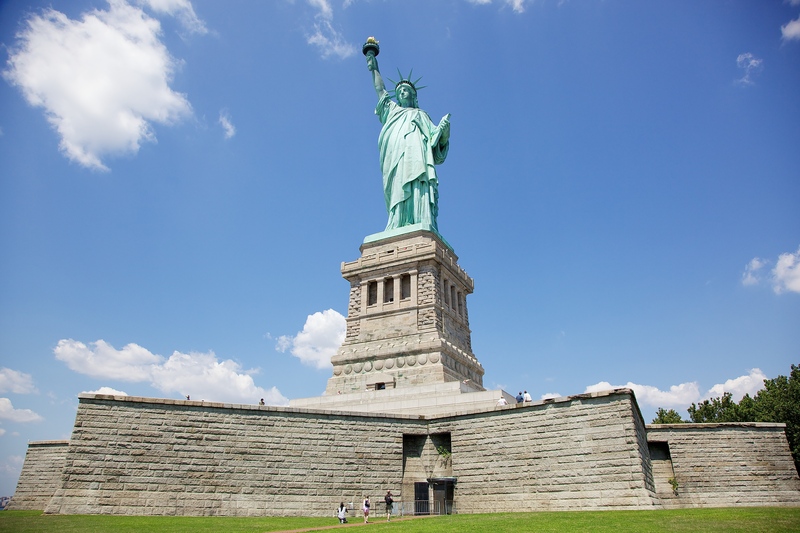 Make Statue of Liberty National Monument a part of your New York City vacation plans using our New York City trip itinerary planner. You can not visit without having seen this New York. On the ferry to Liberty Island you can make beautiful pictures of the skyline. You can also walk completely around Lady Liberty and here great photos. Quite a lot of time to spend here. We took the next boat and stepped off on Ellis Island. Here's to many more to see about the history of the country and you can feel free to stay a little longer. Everything is beautifully presented, definitely check out to move away! A must-see. You have to get on a boat/ferry to see the beautiful statue, and many people can ride on it at the same time. It's a beautiful boat ride with lots of photo ops (the city in the background). There is plenty of room to walk around the statue and you can stay as long as you like. Cute little gift shop there, too. You can get lots of good pictures, too, all around the statue. We already had tickets in advance with our tour group, but didn't get to go inside the statue. Perfect day. Everyone we came in contact with were extremely helpful especially the guys at the lift and on the boat. They all went out of their way to make sure he didn't have to wait in line as there were long queues to board the boat and told us were to stand so we could board first. The guys at the lift to the pedestal were the same. The food on Liberty Island was great, lots of fresh sandwiches and salad and great choices for hot food. Queue was long but moved extremely fast. Views from the pedestal and crown are amazing but the 162 steps to the crown was hard going but I made it. There are a few places on the way up to stand out of the way so other people can pass, thank goodness. ... The views looking back from the boat are amazing, plenty of room on the boat and lots of places to sit.